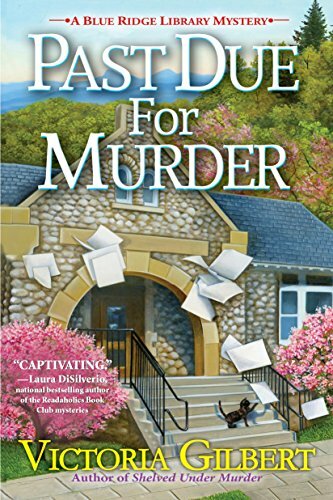 It’s springtime and Wisteria are blooming in the rugged Blue Ridge Mountains, the setting for Past Due for Murder, book three in Victoria Gilbert’s Blue Ridge Library series. In the quaint Virginia college town of Taylorsford revival of the town’s May Day festivities is all folks are talking about—until local college student Lacey disappears on a solo hike. Taylorsford library director Amy Webber thinks there may be a connection between Lacey’s disappearance and the age-old tale of runaway girls who vanished after they were lured into the mountains by mysterious fae spirits. In her search of the library’s archival files, Amy finds an intriguing lead. Apparently, the runaways carried valuable gold coins when they disappeared long ago. Since Lacey recently used the same archives for her own research, Amy guesses that the student must know about the old coins as well. Did the curious coed get lost when she hiked into the hills to find this treasure? Amy has more to worry about than a missing college student. She can’t figure out why her former partner, dazzling and enigmatic music professor Charles Bartos, has unexpectedly shown an unwelcome interest in her. Then her new lover, dancer Richard Muir, lies about his whereabouts during a visit to his parents. Amy frets that she has picked the wrong mate again. Gilbert weaves a well-paced, engaging story with strong characters such as the quirky Blue Ridge old-timers, including Mary Gardener whose “face was as lined and grooved as a walnut shell” with “hazel eyes [that] sparkled as brightly as water in a shallow brook.” Gilbert’s intimate knowledge of the Blue Ridge Mountains comes through in her accounts of the countryside and locals’ connection to the land. Also, a good sprinkling of red herrings will keep readers guessing. Finally, there’s a bang-up ending as Amy is chased through the woods by a rifle-bearing madman she deflects with a scattering of gold coins on the trail. Bibliophiles may be disappointed by the infrequent mention of books given Amy’s profession and some mystery readers may find the romance overdone. Still, Blue Ridge Mystery fans will love reconnecting with Amy and her Taylorsford compatriots, and cozy mystery readers will have no trouble starting with book three before they turn to the earlier volumes. Charlene D'Avanzo, a marine ecologist who writes environmental mysteries, has won awards both as an author and environmental educator. Her most recent book is Secrets Haunt the Lobsters’ Sea.